There is an unwritten rule when it comes to all things digital — steer clear of words like “procreate” unless you want to be flooded with spam or subject to images of an adult nature. In the case of Procreate for iPad, however, an exception can be made. In this instance the images are more picturesque than they are perverse and there is not a hint of spam to be found. 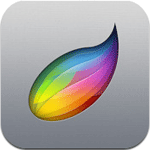 Procreate takes up a position on the App Store among some already well established paint applications, some of which have even been endorsed by Apple, but you get the feeling that this could well become an artist’s tool of choice for iOS. 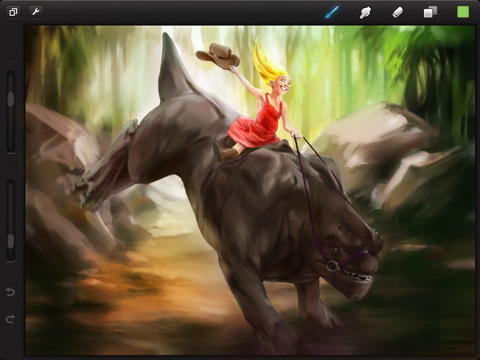 Unlike many apps of its kind, Procreate does not bombard you with what it can do, providing instead a workspace that helps the user show what they can do. The balance of form and function is critical when it comes to creative tools and Procreate seems to have found the right mix. A traditional artist does not block their view of the easel with a giant paint pot and a swarm of brushes so, while standard features such as layers, customisable brushes and a full color palette are available in Procreate, the blank canvas is your main focus when using it. What few controls are found on the main screen are nicely positioned within a small black border and include brush size and opacity settings as well as tool selection so you can make swift adjustments and continue your work. Undo and redo buttons are also close to hand and provide a genuine lifeline for the fat fingered. 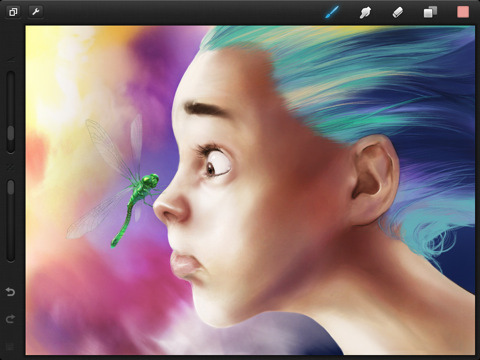 Procreate does not mess about with gimmicks, like the “realistic” paint found in some apps of this type. While it’s fun to mess around with virtual oil paint it never really leads to getting much done. 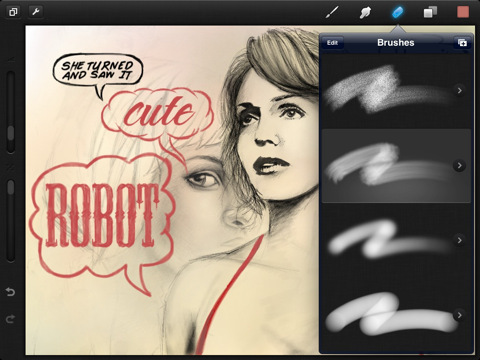 Instead the app offers straightforward brushes and provides you with the option to create your own if need be. Every brush type can be altered in numerous ways and you can even import shapes and grains from images on your iPad to form the basis of a brush. Colors are simple to chose, although it would be nice to see a way of storing favorites for quick access. This issue is somewhat negated, however, by the color picker feature that allows you to tap and hold on any color in your image to select it automatically. Another huge time saver. Export-wise, you are pretty much limited to sending images via email or storing them in your iPad’s photo library, with no option to use iTunes file sharing or any online storage at present. We tested this app with a traditional artist and a complete novice at the helm with both experiencing pleasing results. Procreate is both simple enough to get to grips with quickly and powerful enough for the experienced artist to achieve their goals without a doubt. For those looking for a creative app that they will get some real results from, the $4.99 asking price (although free at time of writing) is certainly justified. Although this is not the first iPad paint app and the word procreate might conjure memories of that awkward talk you had with your parents as an adolescent, this is one form of reproduction you will be glad you heard about.